Engine: 6 cylinder 750 brake horse power by Mirrlees Bickerton & Day Stockport. 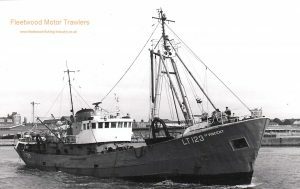 04.1959: Built at Portsmouth as the “pocket trawler” WINMARLEIGH. The vessel was named after the Parkes family residence at Knott End, Over Wyre, from Fleetwood. Winmarleigh Hall. 6.3.1960: Arrived Lowestoft from builders to take on fishing gear. 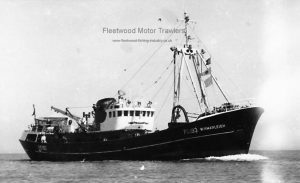 7.3.1960: Sailed Lowestoft for fishing grounds. 22.3.1960: Arrived Fleetwood from maiden voyage. 03.01.1961: On voyage from Fleetwood (Sk. Charles Thomas Robinson). Cleared Lune Buoy at 1345 on a NW course at 10.5 knots. Mate James William Ball took over the watch. After the change of watch the helmsman complained of feeling unwell but able to complete his watch, so the mate left the bridge to get some Beechams Powder for him. At this time the vessel was said to be some 15 miles off Maughold Head but must have been only 5 miles off. The inquiry heard that the helmsman stated that he was uneasy at the proximity of Maughold Head Light and called out twice to the mate, who didn’t return to the bridge prior to the stranding. The helmsman was about to call out the skipper when the vessel grounded and the skipper responded immediately and put the wheel hard to starboard. Fortunately the vessel came about without bringing up. WINMARLEIGH returned to Fleetwood and was slipped but had sustained no serious damage. Blame for the incident was shared between the mate and the skipper with the mate’s certificate being suspended for 12 months. 11.08.1962: At anchor at Wyre Light. Sk. Charles Robinson taken ill and died of a major heart attack. Unable to contact the shore as the vessel was only equipped with ship to ship radio and attempts to contact M.T. PRINCESS ANNE (FD15) also at anchor failed. A searchlight was rigged on the boat deck and an SOS was flashed to PRINCESS ANNE, who notified the port authorities. 27.4.1967: Renamed BOSTON HERCULES FD193 same owners. 15.2.1968: Sold to George Craig & Sons Ltd. (North Star) Aberdeen. Date ? : Sailed from Fleetwood in the livery of North Star bound Aberdeen. 16.10.1970: Transferred to H.K.F. 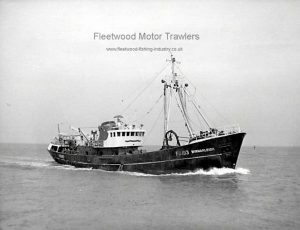 Trawlers Ltd Aberdeen, a subsidiary of George Craig & Sons Ltd.
27.3.1975: Sold to Claridge trawlers Ltd. (Colne’s) Lowestoft. John Leggett 8 to 13 Waveney Road Lowestoft manager. 1.3.1975: Arrived Lowestoft as BOSTON HERCULES A160. 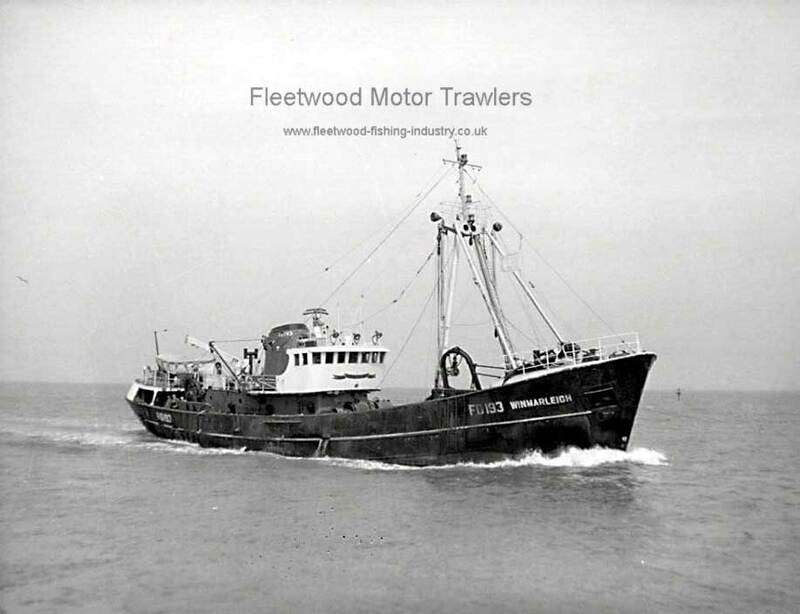 3.4.1975: Registered to Claridge trawlers Ltd. Lowestoft. 18.4.1975: First landing at Lowestoft as BOSTON HERCULES A160 Landed 236 kits grossed £6,182 12 days Skipper Alfie Hitter. May 1975: Renamed ST.VINCENT LT123. 12.4.1985: Sailed from Lowestoft painted orange bound for the English Channel for survey work, but went aground off Pakefield and returned to port, sailing again the next day. On her return the vessel was laid up. 1.6.1985: Sold to Henderson & Morez. Gravesend for breaking up. 19.10.1985: Sailed from Lowestoft being towed by the tug EUGENIO owned by TSA Tugs Ltd. Leigh On Sea. Bound for Sun Wharf. Gravesend. Kent. 20.10.1985: Arrived Sun Wharf. Gravesend. Kent. 2.1.1986: Lowestoft register closed on the advice that the vessel was broken up. The Coroner (Mr. W. Blackhurst) decided that Skipper Charles Thomas Robinson’s death in his cabin aboard the 310 ton WINMARLEIGH on Saturday night was the result of natural causes and that an inquest was unnecessary. Mr. Robinson collapsed and died while the vessel was waiting for the tide in Morecambe Bay to come into Fleetwood with 330 boxes of fish after a 14 day homewater fishing trip. The mate, Mr Owen Lewis, brought the WINMARLEIGH (Boston Deep Sea Fisheries Ltd) into port. Skipper Robinson had been born in Hull but lived most of his life in Fleetwood. He had been ill for some time and it was his first trip in three months. The funeral is at Carleton Crematorium and will be conducted by Mr Duncan Brown, superintendent of the Fleetwood branch of the Royal National Mission to Deep Sea Fishermen. 05/01/2018: Removed FMHT watermarks and added an image. This entry was posted in Fwd Near Water Trawlers, Motor Trawler on 20th September 2016 by Howard Small.